Atlanta has made its way to Black Twitter yet again. The hashtag #Atlantataughtme brought together native ATLiens and newcomers, both sharing lessons learned from the city. Of course, most of the commentary shed light on what most of us already know; there are more rappers than Peachtree streets and traffic is just a rite of passage. If you plan to ever move to the dirty South, here's what you need to know. Check out some of the best tweets. There are plenty of familiar faces. There is no scarity of trap music. Everone is somehow booked to capacity, yet very available. Bring a lawn chair for the Chick-Fil-A lines. If you ask someone where they're from, don't exect a straight answer. #AtlantaTaughtMe it's ok to use trap, shawty, and y'all in daily conversation, anywhere, with anyone. Best of luck in traffic. And, it may be necessary to add a separate account for your extracirricular activities. 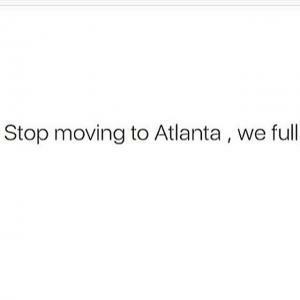 As an Atlanta native here's the biggest lesson I've learned. Tell us what Atlanta taught you in the comments below.